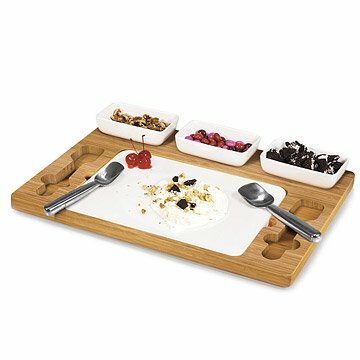 Take your ice cream toppings a little deeper with this mixing kit, featuring a marble slab and bamboo base. Take your ice cream toppings a little deeper and sprinkle your dessert with the DIY spirit. Featuring a marble slab, two mixing spades, and three ceramic dishes nestled on a sleek bamboo base, this fun set lets you create new ice cream mixes with chocolate chips, fresh fruit, and any small, petite sweets your heart desires. Simply freeze the marble slab for several hours, or until you're ready to mix, then combine your ingredients for an all new flavor, made by you—perfect for birthday parties, summer barbecues, and fancy family movie nights. Made in China. Wipe surface with a damp cloth. To prevent wood from warping and cracking, do not submerge in water. Hand wash slab, ceramic dishes, and tools and towel dry immediately after washing. The slab gets nice and cold and keeps the ice cream well when mixing all the fun ingredients. Our friends really enjoyed the product and had no complaints! I gave this to my future sister-in-law at a wedding shower. No one knew you could buy one and everyone loved it! My sister-in-law loved it!